Scott Jackson came through with flying colors, or should I say watercolors, when Bruce asked for a Jukebox. It has since been retired as the original foundation for his original website and Ye Olde Record Shoppe's last known logo. I have encluded it here and although it is large, and takes awhile to download, there is a smaller version as well. Each of the images here on this page have one of Bruce's hidden links if you dare..! I then took the original and scanned and compressed it down and then made a transparent copy. 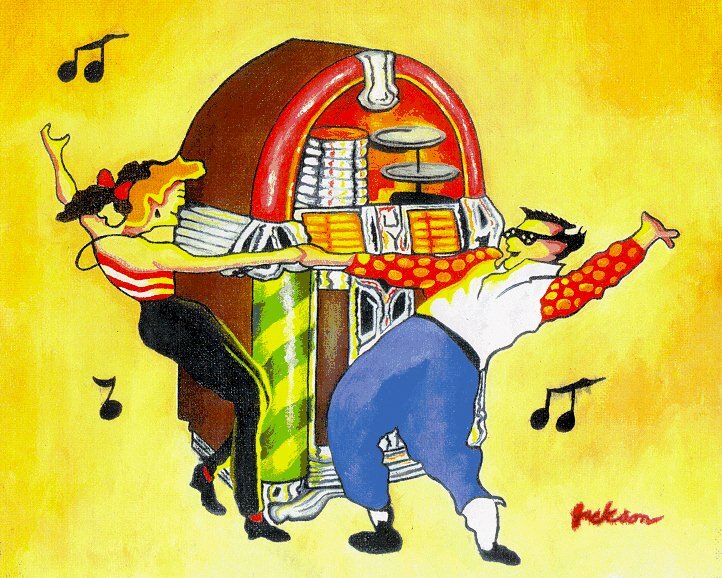 And, at Bruce's request to have a "dancing jukebox", I made a simple mirror of the image and wallah..! It's to your left and it's for you to have as a gift. If you want to try this handy tool right now, just click here..!